Ben Cohen is not making sweeping judgments about the left, but he calls a spade a spade and does not spare the spiritual rod from those who engage in any form of anti-Semitism. Ben Cohen’s book consists of the following chapters: “The UK, Jews and Israel; the Middle East and Israel in Context; Chapter Three: BDS – anti-Zionism in action; Anti-Semitism and anti-Judaism; The US and Israel; On Islamism and Iran and a valuable Index. Ben Cohen’s articles are brilliantly written and of great analytical penetration based on extensive reading. This highly readably book is full of information. Friends and enemies of the democratic and Jewish state can read it with profit. 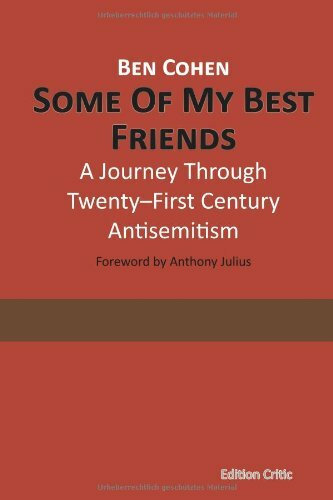 Ben Cohen: Some of my best friends / A Journey Through Twenty-First Century Antisemitism, Edition Critic, Berlin 2014, 230 pages, Euro 18,00, Order?